New Kids On The Block is a must-see panel at any Connect. Some of the most interesting conversations take place in the lobby. There are more parties than you can possibly attend, but you should network at as many of them as possible. Since the first Inman Connect event I attended five years ago, I haven’t missed a single Connect in San Francisco or New York, and there has never been a question in my mind about going. Whether you work at a franchise, independently or as a broker or agent, Inman Connect offers opportunities for all. 9. It’s in NYC, baby! I mean, who doesn’t want to go to the Big Apple and hang out with some of the smartest folks in the real estate industry? Let’s be honest here: I live in a village — Pinehurst, North Carolina, is tiny. Going to NYC is a real treat. I’m not talking about the boy band. I love seeing the new startups make their big pitches on stage. Some of them are amazing speakers, and some are not. But they all believe in their product, and there’s something special about seeing people who are passionate about what they do. I love seeing the new startups make their big pitches on stage at #ICNY. I make time to walk the floor and check out what the vendors are up to — both the new and the old. It’s a great way to see the new shiny objects coming our way, and vendors love to learn from agents about what they need and want to help them manage and create business. There are some amazing restaurants where you can grab a bite in NYC, and you can always find a few folks who’d love to join you. I have ended up sitting next to some industry powerhouses, totally by accident, who now are cherished friends. There are more parties than any one person could attend, but you should go to as many as you can. It’s called networking. The lobby is one of the best places to meet the best people. Take a stroll around the lobby, and you will see the best of the best in the real estate industry having casual conversations, masterminding and deal making. Introduce yourself. Amazing speakers sharing their knowledge on a vast array of topics. Pick and choose what you need. It’s a smorgasbord. CEOs, celebrities and just good people comprise the speakers on the main stage. Topics that will push you to learn, grow and think. There are presentations, interviews — and there was even a little singing once. You won’t want to miss best-selling author Seth Godin this year. Did I mention the people? That’s what this business is all about. This is your opportunity to connect (do you like how I tied that in?) with people across the entire spectrum of our industry. It expands your thought process to hear what other folks are doing, building and thinking — not just your office or company. Get out of your box. So why go to Inman Connect? Because you will learn something new. Because you will meet someone who has different ideas. Because you will grow — and your business will be better for it. So that’s my list. 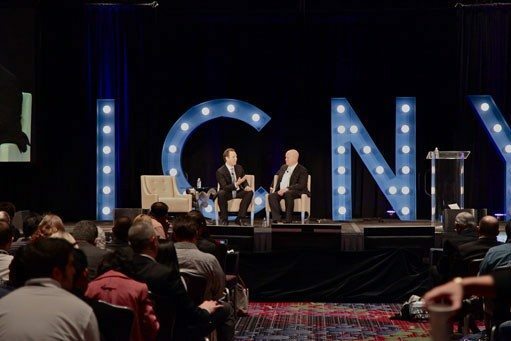 I’ll see you at #ICNY! Bring your walking shoes and an open mind. Why go to #ICNY? Because your business will be better for it. Laurie Weston Davis is the CEO of Scott Lincicome Properties. Follow her on Twitter or Facebook.